The Ohio Taiwanese American Students Association (TASA) family would like to welcome you all to celebrate the Mid-Autumn Festival with us at our annual Moon Festival Showcase! TASA’s Moon Festival Showcase aims to celebrate and highlight the Mid-Autumn Festival (aka Moon/Mooncake/Lantern Festival), a traditional holiday centered around family, friends, food, and the lunar calendar observed by the people of the East and Southeast countries of Asia. We want our attendees to walk away with a greater knowledge of traditional Asian culture, memorable souvenirs, fun memories, and a stronger connection to OSU’s Asian American community. Join us for a night filled with games, food, and crafts from all cultures! Meander around the different club booths while watching spectacular performances put on by your very own OSU students! Free food and snacks will be provided. 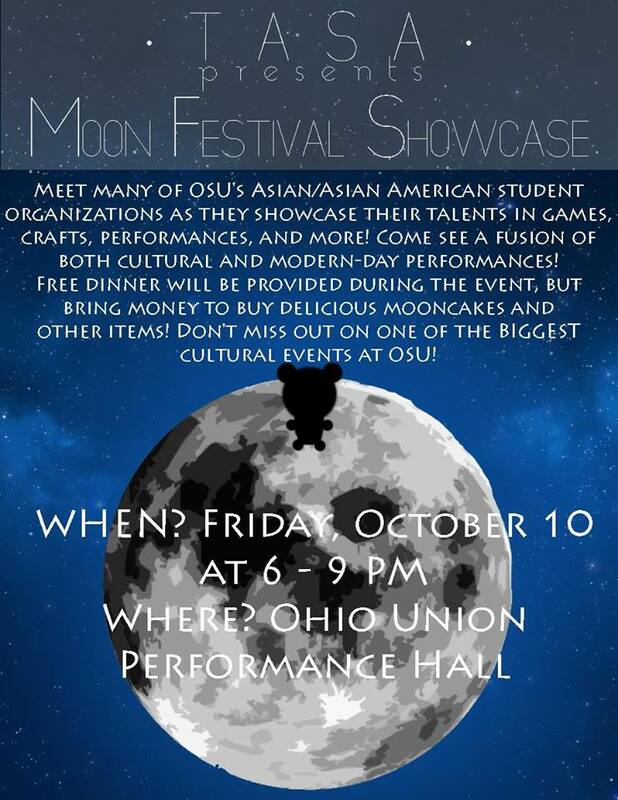 Don’t miss out on one of the biggest cultural events at OSU!